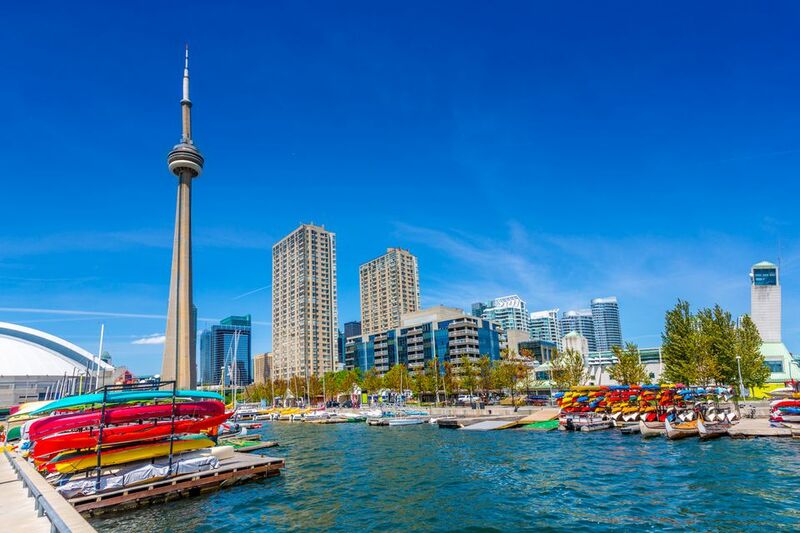 The hubbub of Toronto in July may be just what you're looking for or may be enough to make you think about visiting at another time. It all depends on you and what you want from your Toronto vacation. Of course, many people have time off with their families in July and August because school is out, so flexibility with dates may not be an alternative. If the July crowds have you feeling claustrophobic, consider a day trip out of town to neighboring vineyards like in Niagara-on-the-Lake or any of the many nearby charming towns. The city's best attractions will be busy. Consider buying a Toronto attractions pass that saves you money and time in lineups. July is generally hot and muggy (humid). Evenings can cool off considerably especially by the water, so a jacket is still necessary. Visitors can expect rain about 10 days out of 31 in July. Shorts; t-shirts; light-colored, long sleeve shirts; bathing suit; light, long pants; sandals; closed-toe shoes. Bug spray if you're heading out of the city. You may not use them, but it can't hurt to bring a light jacket or shawl. Festivals galore and lots of waterfront activities to enjoy. Summertime means the full throng of summer visitors has arrived; something is always going on in Toronto in the summer. Summertime is patio season, a nice way to while away the day or evening. Canada's biggest theme park, Canada's Wonderland, is open. Enjoy a day at the Toronto Islands, including the beach at Ward's Island. Temperatures in the 80s and sometimes 90s and high humidity may be a turnoff to some. High season means higher travel prices, fuller than usual hotels and restaurants and possibly longer lineups at Toronto's tourist attractions. Reservations are recommended and book early! July 1st is Canada Day, a national public holiday. Banks and most stores will be closed. Toronto hotels will be busy, so book as far in advance as you can. Though summer is high season, you can save on accommodation if you stay in one of the university residences that is empty. These offer a central location at very competitive rates (under $100). See a complete list of Toronto hotels and read their reviews on TripAdvisor. Toronto Outdoor Art Exhibition: North America's largest and longest-running outdoor fine art festival with more than 500 juried artists. Fringe of Toronto Theatre Festival: Toronto's largest theatre festival. Over 138 stage productions from Canada and around the world. The Shaw Festival is about 1.5 hours down the highway in Niagara-on-the-Lake. This is a world-famous four-month long theatre event that highlights the works of Bernard Shaw, his contemporaries and up and coming Canadian playwrights. The Stratford Festival is another acclaimed theatre event with a special emphasis on the works of William Shakespeare. Inexpensive shuttles go between Toronto and the charming town of Stratford during the festival months. The TD Canada Trust Toronto Downtown Jazz Festival: Canadian and international musicians performing diverse styles from traditional to fusion, blues to bebop. Toronto Beaches International Jazz Festival, end of July: This chic part of west Toronto closes the street off to traffic once a year for 10 nights to enjoy live music and merrymaking. Summerlicious: More than 100 of Toronto’s finest restaurants offer special prix fixe menus.